I said yesterday I refrained from spinning at work because all had righted itself in my office, at least for me. Well, that didn’t last. The righted lasted; I mean the not spinning at work. I totally did pull out the roving and spin a bit during my lunch break. Not going to lie, I was just a tad nervous about it. I’ve been spotted knitting at lunch before. Knitting in public doesn’t bother me. I don’t care who sees me doing it. I made a friend with a one year old at my husband’s bowling league one time because he was memorized with the needles (I even got an unexpected hug just before he went to hug his grandparents goodbye, which was pretty random but so very adorable at the same time). I get the most attention at bowling, actually. 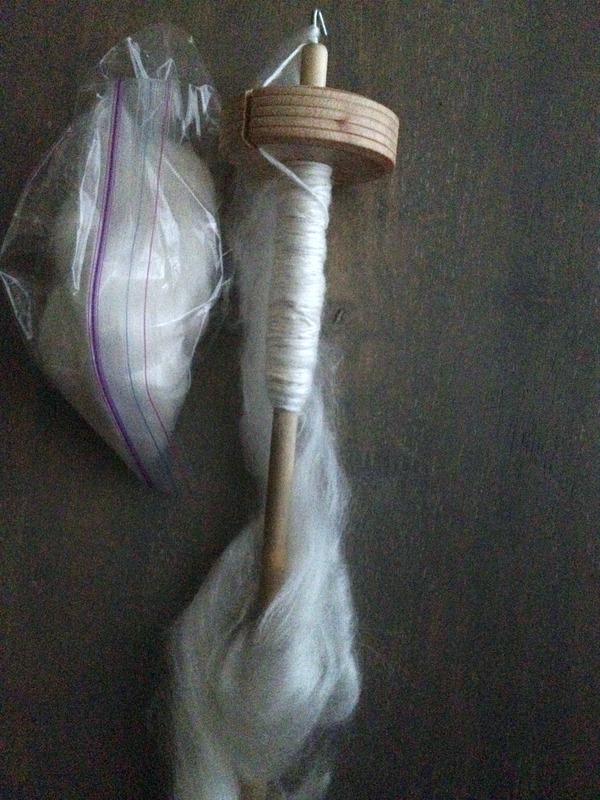 So, while catching up on The Fat Squirrel Speaks podcast, I pulled out my little drop spindle and started twirling. I know I’ve said it before, but I love this podcast. It’s like sitting around with a friend talking about fiber-related awesomeness. I’ll admit, I don’t have fiber-friends around here, so she’s kind of my weekly dose of it. (Although, I’m finding the Internet has a very rich community of knitters that I need to get more into.) Her energy! I envy her so much. I also envy how much gorgeous knitting and spinning she can accomplish in a week. Anyway, my intern came in to ask a question and was completely distracted by my little baggy of roving. After he finished his question, he asked me what all that was. I made him touch the roving; luckily, he’s not allergic to wool, bambino, or silk! I explained what I was doing and that it was for knitting and there was that “ah-ha” look on his face like he got it but didn’t get why I was doing it. It’s okay. That doesn’t bother me. In fact, I find the whole situation quite amusing. He’s the only one who caught me spinning this time. I don’t know if I’m into spinning in public just yet. It’s awkward still at this point, as I’m so very not good at it. I get nervous when just my husband stares at my hands while spinning. I don’t know how I’d do with strangers. Anyway, we’re nowhere near done with the spinning on this. I’m hoping once Chadwick and the shawl are done, I can buckle down and focus just on the spinning. Plus, I might have sort of bought some more roving. Possibly. I was seduced by the color! It was so pretty. Now, if I can find some roving (or yarn) that coordinates with the eye-popping, amazing, beautiful colors of my new 16th edition Chicago Manual of Style that I can’t stop obsessing over, I’ll be set.